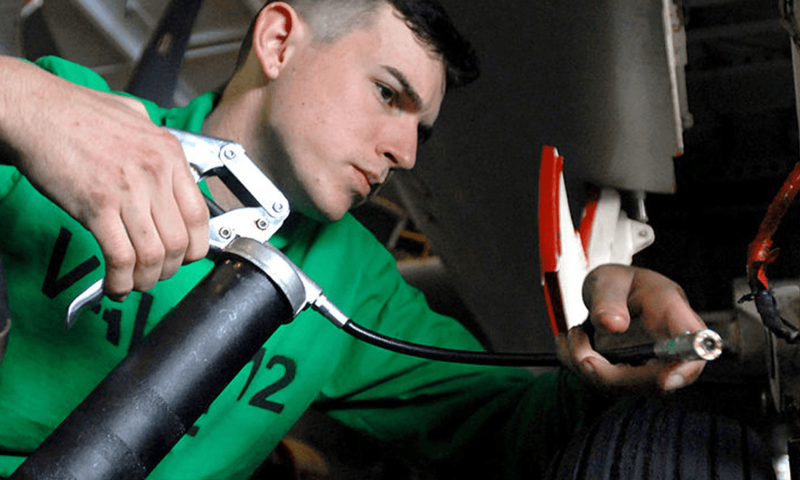 Grease guns are useful tools that help you lubricate certain objects and pieces of machinery. They are great for DIY projects, as well as for performing maintenance around the house and in the garage. It is important to grease metal nuts and bearings to ensure they fit in properly, and it also protects certain metals from rusting. From hand pumped to air pressure, there is a wide variety of guns out there for you to choose from. Though this can seem stressful trying to pick the right one, we have luckily done some of this research for you. View the Best Grease Gun, Below. How do you load a Grease Gun? How do you use a Grease Gun? Looking for Glue guns? Try these hot glue guns. We consulted experts, bloggers and customer reviews to bring you this list of the top 10 best grease guns available to buy online right now. This is a very powerful grease gun that has over 10,000 psi worth of pressure for some of those tougher jobs. This pump can deliver up to 5 ounces of grease per minute, making quick work of whatever task is at hand. It is entirely cordless, running on a rechargeable lithium-ion battery. The 20-volt battery will last for up to sixteen different grease cartridges worth of work before needing to be recharged. The hose is extremely flexible and is 42 inches long, helping you to wind into those hard to reach areas. It has a unique filter inside the pump helping to protect it against dirt and grease build-up, which reduces the amount of maintenance required from the user. Customer reviews are very positive, and confirm this is a durable machine that will be helping you with your greasing needs for years to come. Most DEWALT products are produced in the US, supporting local industries across the country. See more information on DEWALT Cordless DCGG571M1. If you are looking for a powerful grease gun that gets into all of the nooks and crannies without compromising on durability or reliability, this is a perfect choice. DEWALT also use factories across the United States, ensuring products are built under US manufacturing standards. This is also a very powerful machine and is operated without a cord, giving you the ultimate freedom to use it wherever you need to. Consistently good customer reviews mean it has been awarded Amazon's Choice, and the durability of this machine is fantastic. It will last you a lifetime thanks to the high-quality materials used, and careful manufacturing. It provides two different flow rates - with the maximum being 10 ounces per minute. This makes it one of the most powerful options on the market. The 48-inch hose is entirely flexible so you can reach into more difficult places, and can also be clipped to the top of the gun for easier jobs. The battery is rechargeable and is usually good enough to run up to 10 grease cartridges. A comfortable shoulder strap is also included for easy carrying from one job to the other. See more information on Milwaukee 2646-22CT Gun. If you have a larger budget this is a fantastic choice as it is sure to be one of the longest lasting machines you can buy. It is incredibly powerful, performing far quicker than most other grease guns currently available to buy. If you're just looking for a grease gun for basic jobs and touch-ups, it can be much more cost effective to invest in one of the mini options. 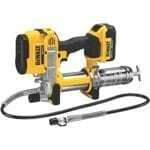 This is a very budget friendly mini grease gun - coming in at the lowest price on this list. The needle tip nozzle also helps with some more precision-based tasks and is great if you are targeting a very small area. At only one pound in weight, it is very easy to carry and can be easily stowed away in most tool boxes. It is hand operated, using pneumatic technology to allow the grease to be pushed through onto the surface you need to lubricate. The canister can hold up to three ounces of grease, which is perfect for most small jobs - though you may need to consider a larger option for bigger tasks. This is Amazon's Choice for mini grease gun thanks to excellent customer reviews, which state that it is very easy to use tool and cost-effective. See more information on Astro 101 Mini Grease Gun. If you need a good budget option for small jobs, look no further than the Astro 101 Mini. This gets the job done, and is by far the cheapest option available without having to compromise on quality. If you're still on a budget but need something with a bit more capacity and power, grip guns are another money-saving option that allows you to control them by hand - completely eradicating the need for charging batteries. This heavy duty option is very durable and will make a great addition to your toolbox. The pump head is cast in solid metal to keep it resistant against the grease and ensure strength and longevity. The handle itself is easy to use, and the nozzle is on a flexible cable allowing you to get into those harder to reach areas. There's a small valve at the bottom that allows you to check the cleanliness of the gun, meaning you do not have to dismantle it every time you want to clean it. Customer reviews praise how high quality this gun is, and say that it has lasted them for years with no problems. It will need to be cleaned around once every five or six refills. See more information on Lincoln Lubrication Heavy Duty 1134. The hand-pumped options are fantastic for saving money on the larger electronic models, and this allows you to take advantage of this without compromising on quality. The pump allows large quantities to be shot out at any given time, and the nozzle is great for hard to reach spots. slight upgrade from the grip grease gun, this gun uses pressurized air to give you the power you need behind a good grease gun. The flow speed can be varied using the trigger, allowing you to slow down for more precision-based shots, and speed up for quick jobs. Unlike the grip guns, it runs continuously until the grease cartridge is completely empty, making work faster and allowing you to tackle more precise tasks with confidence. This is also a very durable product, with customer reviews expressing amazement at how long lasting this gun was. Lincoln Electric is so confident in the quality of the gun that they provide one year fully backed warranty with the product. There is a thirty-inch hose included for you to work on those hard to reach areas, and this can be detached allowing you to use the gun in regular mode for quicker jobs. See more information on Lincoln 1162 Air Operated Gun. The electronic guns are expensive, but we highly recommend at least upgrading to this option. Though it is a little pricier than the grip guns, it will save you a lot of time and effort, and the one year warranty is great for peace of mind that it is a hard-wearing product. This is another great option if you are looking to save a little bit of money and go with one of the grip guns. The canister is specially designed for durability and comfortable use. It has special air-tight features that prevent grease leakage from occurring during heavier jobs and a unique grip section on the canister so it is easy to hold when in use. This is, of course, refillable after each application as you need it. It operates up to 6000 psi, hence the name, which though weaker than the electronic and air pressure models is still quite good if you just need a simple grip gun. This allows it to work quickly and efficiently on most household and mechanical jobs. There is a small hose included getting into harder to reach areas which are 18 inches long and produced using a heavy duty material to protect it from cuts and leakages. See more information on AcPulse GGP-001-AP Professional. Do not be fooled by the reasonable price - this is a very high-quality grip gun. It is a little clunky to operate, but once you get used to it the power is amazing. It is very long lasting, and customer reviews confirm that they are happy with the durability of this gun. This is another fantastic budget option if you are happy to use a grip gun for basic tasks around the house and in the car. The canister has a grip on the bottom half allowing it to sit comfortably in your hand and prevent any slippages or accidents. The flexible hose attachment is sixteen inches long and is much better than other grip guns at being able to get into those hard to reach areas. It is made out of anodized aluminum, which is protected against rust and other wear and tear issues. Lnchett provides a one year warranty with this product, giving you reassurance that it is very high quality. According to customer reviews, the pump is quite powerful - especially for a grip grease gun - and the overall gun is very long lasting. The hose is protected against cuts and leaks, and the canister can be easily refilled and cleaned without the need to pull the whole machine apart. See more information on Lnchett Car Grease Gun Set. This is one of the safest and most durable options of the grip guns, and it comes in at an excellent price point. We highly recommend you consider this as an option if you are trying to stick to a budget but do not want to compromise on quality - especially as far as safety is concerned. This is a very heavy duty and very powerful grip grease gun and is also the second cheapest on this list. It can reach up to 7000 psi of pressure, making it the most powerful option available of the smaller, grip powered guns. It can be loaded either directly with canister, or with the pump itself using suction. This is convenient if you are quickly working through tasks and only need to use a small amount without having to completely fill an entire canister. The barrel is made with hard wearing steel that has been reinforced against rusting as well as general wear and tear caused by bumps and scratches. This makes it a very tough and durable option. There are small ribbed sections along the canister to make sure you have a safe grip of the gun whilst using it, and there is a locking function to protect against accidental use - perfect if you have kids running around the house. See more information on Lumax LX-1152 Grease Gun. This is only slightly more expensive than other budget options but packs a much more powerful punch meaning it is more than worth the extra few dollars. It is one of the best options if you are worried about kids getting into your toolbox thanks to the safety locking function preventing against accidents. Another quite powerful option for grip guns, this packs 6000 psi of pressure in a small and easy to use a gun. There is a rubber grip at the bottom of the canister which makes using it comfortable and safer. It is fully compatible with 14-ounce grease canisters, and can also be reloaded with your own grease. The plunger at the base is designed to give you maximum pressure without the risk of leakages. The hose is 18 inches long and incredibly flexible - perfect for getting into smaller nooks and crannies. Braves are so confident with the quality of this product that they provide a one year warranty with all purchases. See more information on Bravex Gun-SW-02 Pistol Grip. The non-slip rubber grip on this is fantastic and one of the most comfortable to handle out of all the grip guns. A warranty is always a welcome feature with any tools you purchase, and Bravex has provided a full year with this gun. This new and improved grease gun from GreaseTek is designed by a company that specializes in lubrication application guns. The plunger has a unique design that allows it to be loaded and used easily and without leakages. A single squeeze of the grip delivers around one ounce of grease - a pretty reasonable amount for a grip gun. The handle is ribbed to make it much more comfortable to use and ensuring it will stay in your hands - even during the greasiest of applications. The flexible hose is eighteen inches long and reinforced to protect against leakages and splits. The hose can be switched out for a regular application rod, for quicker applications that require a little bit more precision. See more information on GreaseTek 910100 Pistol Grip. If you want to maintain some precision when greasing surfaces, this is an excellent budget option compared to the electronic applicators. It is easy to load and use. As with any tool you want to make sure your grease gun is safe to use and will last for as long as it can. If it is manufactured in the US, Canada or EU then it will conform to strict safety standards – however, if it is manufactured elsewhere you should always read the fine print. Most tools have to undergo some sort of safety certification before being sold in the United States, but it is always worth making sure. Related: Best Nail Guns Review. Customer reviews will allow you to get a good idea of what guns are safe and how long lasting they are. It should be lasting most customers at least a few years, if not permanently. Grease guns using reinforced materials and stainless steel will last a lot longer than others. If you are worried about kids getting into your tool cupboard, some of the grease guns have a safety lock feature. This means they cannot be activated simply by pushing them whenever the lock is active, and this safety lock is usually harder for kids to find. Definitely consider one of these options if you have children running around the house. Finally, always consider if it comes with a warranty. It’s rare to get lifetime warranties for grease guns, but the longer the better. Aim for at least one year. This not only protects you against damages to the gun for the warranty period, but it also means the manufacturer is confident in the quality of their product. Higher pressure guns will cover larger areas quicker, whilst lower pressure guns will be able to give more accurate aim in more specific areas. If you think you need a variety of these, look at a gun that has variable pressure. Manual guns can definitely be varied, and a lot of the more modern pneumatic guns will also have toggles for changing the pressure. Accuracy is not as important as you might think for household tasks, but for more professional grade tasks you want one which comes with a reasonably narrow stream so you can pinpoint exact areas that need to be greased. You should definitely, in both cases, consider a gun that has a hose attached. This will allow you to get into harder to reach areas, and give you some flexibility over where you can aim the grease at. Grease guns are used to apply lubricants to various areas that it is required for a DIY project or maintenance. This grease is usually helpful on metals – especially where bolts and bearings are used. This lubrication is important for helping to slide components together, as well as for maintaining the quality of certain metals. The grease is usually fired using a certain force of pressure. There are two main methods of doing this – you can either fill the barrel directly with grease, or you can insert a cartridge. For the cartridge, you simply need to unscrew the top, remove the empty cartridge, and insert a new one. For regular barrel grease guns, you will have to open them up, place the end of the barrel into the grease, and pull the plunger back to fill it up with grease. There are three different types of grease guns that all work differently – grip guns, regular hand pushed guns and pneumatic guns. For grip guns, you need to hold the two grip points in your hand and slowly squeeze as the grease is fired out. You can squeeze faster if you want more pressure. The regular hand pushed guns are rarer to find these days, but if you are saving money you might find yourself with one of these. These usually have some sort of plunger with a coil wrapped around it at the back of the gun. You need to push this with varying hardness depending on what pressure you would like the grease to come out at. If they have a spring this will naturally pop back out when you are done. Very few do not, but with these, you will need to pull it back out yourself. The pneumatic guns are by far the easiest. These are powered electronically, so you usually just have to push a trigger and let it do its thing. It may have pressure variances, and these are usually controlled with a little knob on the side of the machine. Keep in mind that most require batteries, also. The range of grease guns available is quite large, but most of them can be fit into simple categories. If you are only needing it for general household and car maintenance then saving money on one of the cheaper, manual options is your best bet. If you need something more professional, we suggest the pneumatic guns. These are pricey, but the precision and variable pressures are fantastic and great for basically any job you could imagine. As always, safety should come first. All of the guns on this list are safe to use and easy to maintain, but we also suggest doing some further research. Keep some of the points mentioned here in mind, and we are sure you will find the perfect grease gun in no time. If there is one feature you should prioritize, we suggest you go for a gun with a bendable hose. This is the best upgrade, as it gives you ultimate flexibility over your aim. 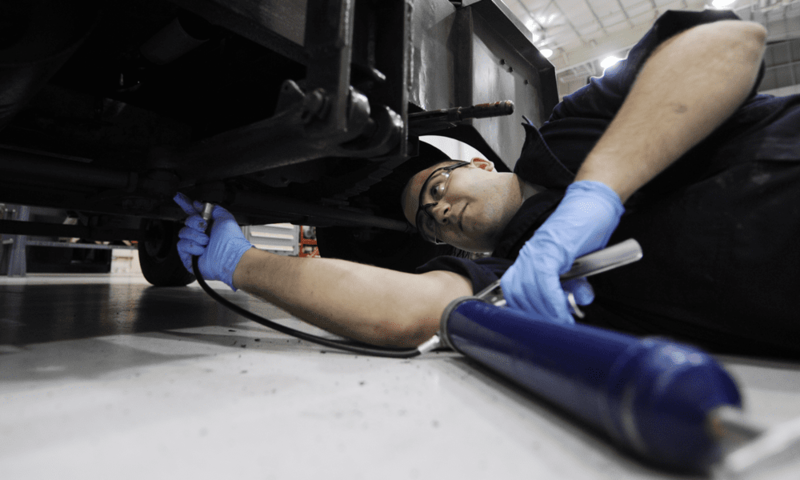 We hope you enjoyed our article on "10 Best Grease Guns in 2019", if so, please share and rate it.